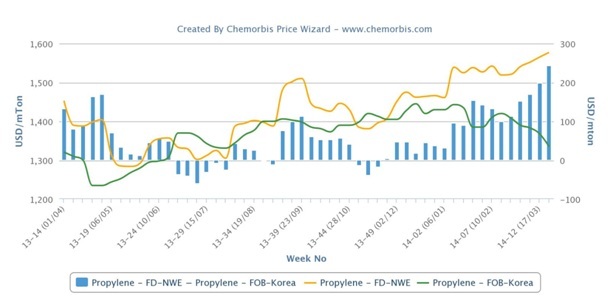 Spot propylene prices are tracking divergent paths in Asia and Europe as per the pricing service of ChemOrbis. The premium between spot prices in the two regions reached the highest level in a year after European propylene extended its gains for two consecutive weeks while spot prices in Asia posted gradual decreases during the same period. 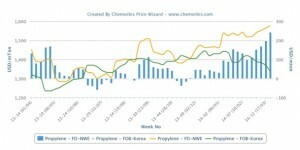 In Europe, spot propylene prices on an FD NWE basis are up by €10/ton from last week to reach the highest level in a year. Tight supply in the region was cited as the main reason behind firmer prices. Despite short availability for propylene, cracker operators are reluctant to raise their run rates due to ample ethylene supply. Even though higher spot prices resulted in firmer expectations for the awaited April propylene settlements, spot naphtha prices on a CIF NWE basis are mostly stable on the week and they are standing around $30/ton below early March levels. Spot propylene prices in Asia maintained their downward momentum and declined around $15/ton on an FOB South Korea basis week over week. When compared to the beginning of the month, spot prices have posted a total decrease of $35/ton. Softer prices were attributed to high stock levels in the region. Idemitsu Kosan shut their Tokuyama cracker in Japan following an earthquake on March 14. However, the shutdown did not have an impact on the market as the cracker, which has a propylene capacity of 450,000 ton/year, was expected to resume operations in a couple of days. According to ChemOrbis, however, market sources pointed to the upcoming planned maintenance shutdowns in Asia, which may ease the downward pressure from high stocks in the medium term. Most of these shutdowns are set to start as of March while a few of them are reportedly ongoing, with the restart date being slated for April.